As I am preparing for our annual Spring Break camping trip, I am telling myself I will maintain some sort of healthy eating habits while away! I wanted to make a snack for the whole family that tasted good but also provided some nutrients and protein (not just sugar and carbs!). I had recently eaten a spicy trail mix that I loved. The issue was that it didn’t have much in the way of protein or real nutrition. The recipe is a mix of cereals and other dry snacks, baked with a rich coating of butter, Tobasco and other seasonings. In a flash of genius I decided to try making it with, you guessed it….Beef jerky. I wasn’t sure how the beef jerky would work after being coated and baked but I was thrilled with how it came out! The saltiness of the beef jerky mixed with the savory butter flavor and heat from the Tobasco were a perfect combination. 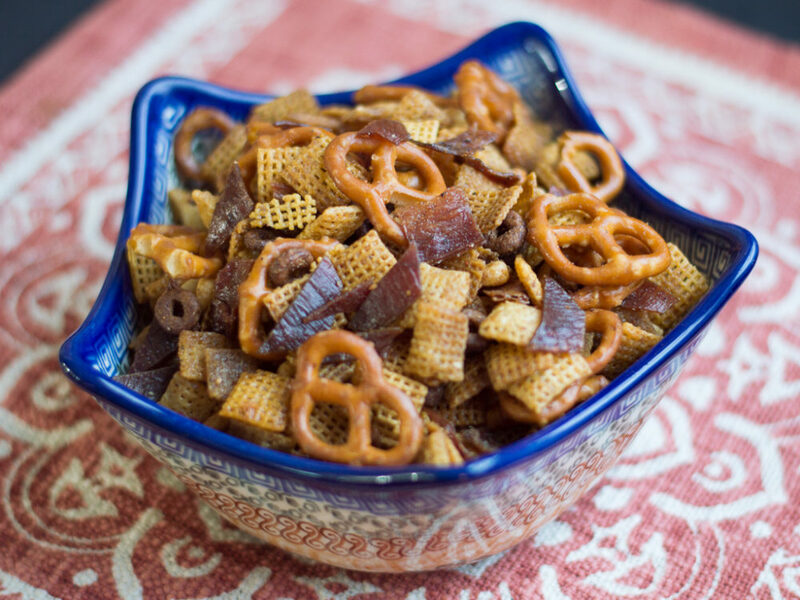 The jerky adds another texture and pop of flavor to the typical cereal mix. North Creek Smoke House Beef Jerky’s dryness works perfectly to absorb the flavors from the seasoning, just like the cereal. I made my mix gluten free by selecting the gluten free versions of the products listed! Feel free to sub another cereal, cracker or dry snack item for what is listed below. 2.Line a large baking sheet with foil and spread all snack items out on baking sheet. 3.Mix seasoning salt, garlic salt, cayenne pepper, Tobasco sauce and worcestershire sauce into melted butter. 4.Pour butter mixture over dry cereal mix and stir gently. 5.Bake for 1 hr and 15 minutes, stirring frequently. (approximately every 15-20 minutes). 6.Remove from oven, cool by transferring to wax paper.